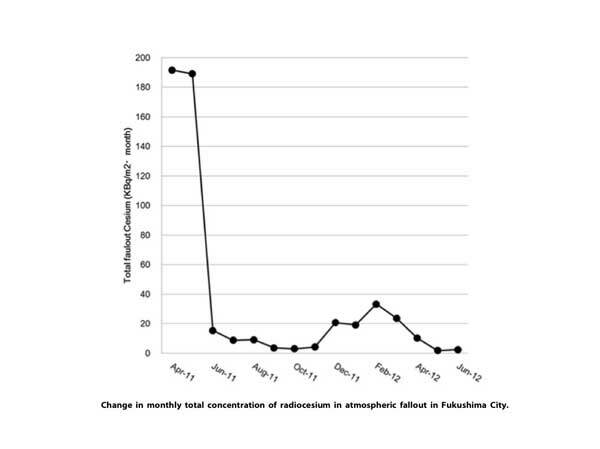 Following the massive earthquake that struck eastern Japan on March 11, 2011, a nuclear reactor core meltdown occurred at the Fukushima Daiichi Nuclear Power Plant, operated by Tokyo Electric Power Company, and was followed by the release of large amounts of radioactive materials. 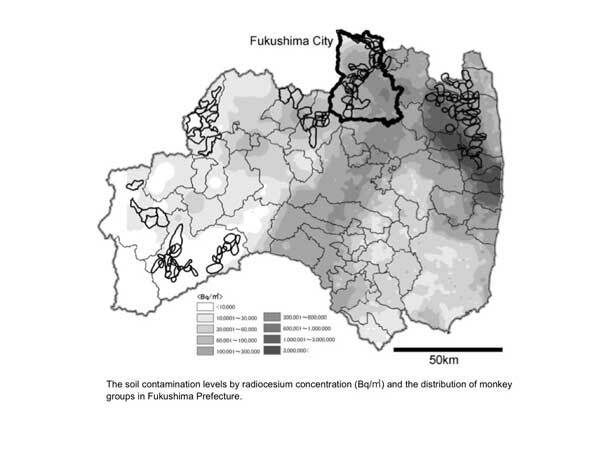 The objective of this study was to measure the concentration of radiocesium 134Cs and 137Cs in the muscle of Japanese monkeys (Macaca fuscata) inhabiting the forest area of Fukushima City and to determine the change in concentration over time as well as the relationship with the level of soil contamination. 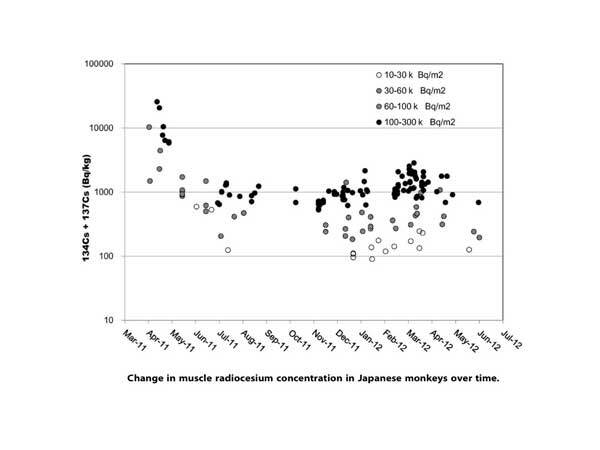 Cesium concentrations in the muscle of monkeys captured at locations with 100,000–300,000 Bq/m2 were 6,000–25,000 Bq/kg in April 2011 and decreased over 3 months to around 1,000 Bq/kg. However, the concentration increased again to 2,000– 3,000 Bq/kg in some animals during and after December 2011 before returning to 1,000 Bq/kg in April 2012, after which it remained relatively constant. This pattern of change in muscle radiocesium concentration was similar to that of the change in radiocesium concentration in atmospheric fallout. Moreover, the monkeys feed on winter buds and the cambium layer of tree bark potentially containing higher concentrations of radiocesium than that in the diet during the rest of the year. The muscle radiocesium concentration in the monkeys related significantly with the level of soil contamination at the capture locations.